Microsoft Exchange servers provide a number of online services, among which is syncing and sharing calendars. BusyCal can connect to Exchange servers, using them to sync calendars across your devices and share them with others. BusyCal can use Exchange servers to sync calendar data across your devices. Exchange is a server that syncs with client apps. BusyCal (for both iOS and Mac) and the built-in Calendar app on iOS and OS X are clients that sync with Exchange. This means any data you enter into the built-in Calendar app on iOS or OS X will sync to BusyCal through Exchange, and vice versa. As long as you have all client apps configured to sync with the same Exchange account, all your calendar and contact data remain in sync. Tap the Connect button next to Office 365 or Exchange. Enter your email address and password and tap Add. The autodiscovery process begins and you may be prompted to enter additional login info. Once the process is complete, BusyCal syncs with Exchange. Exchange is a server that hosts your calendars and syncs them with client apps. BusyCal, Outlook, and the built-in Calendar app on iOS and OS X are all client apps that sync with Exchange. This means any data you enter into one client app syncs to all other client apps through Exchange. As long as you have all client apps configured to sync with the same Exchange account, all your calendar and contact data remain in sync. 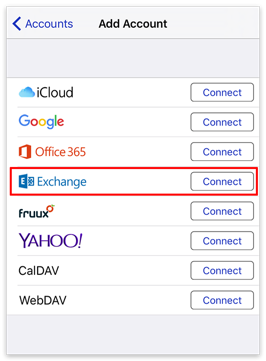 All calendars you want to sync between your iOS devices, Macs, and other users must be hosted on Exchange. You cannot sync calendars from other sources (iCloud, Google, etc.) to Exchange. Exchange enables you to share calendars with other Exchange users. Once each user has configured BusyCal to sync with their personal Exchange account, you can share calendars with each other through Exchange. When a calendar is shared through Exchange, events can be edited by any user and changes sync between them. You can share a calendar through Exchange with other Exchange users in your organization, but you must set this up using BusyCal for Mac (or another Exchange client); you can’t enable sharing in BusyCal for iOS. For details, see Sharing Calendars with Others through Exchange in the BusyCal for Mac help. Exchange places a number of limits on calendar data, which restrict the range of options you can use in BusyCal. BusyCal supports Exchange 2007 SP3 and later, but BusyMac recommends Exchange 2013, which is more reliable than older versions. BusyCal does not support outlook.com, nor the home offerings for Office 365. Only full Exchange services are supported, such as Office 365 for business. Push is not supported in Exchange 2007. Push is supported only in Exchange 2010 or later. To share a secondary calendar with someone, you must also share your primary calendar with them, with at least Availability access. Once you’ve granted someone Availability access or higher to your primary calendar, you can share secondary calendars with them. Only events on your primary calendar affect your availability. Events stored on secondary calendars do not affect your availability and do not appear in the Availability Viewer as blocking your free time. Exchange allows only one alarm per event. Exchange does not allow Alarms to trigger after an event starts. If you create an alarm that triggers after the start of an event, it is converted to an “At start” alarm after syncing with Exchange. If you create a repeating event with a recurrence rule that is illegal on Exchange, it is modified during syncing to be compatible with Exchange and your local copy is updated to match Exchange. Exchange doesn’t allow detached events (or alarms) to overlap the next/previous occurrence of the event. iCloud enables you to sync WebDAV Subscriptions between your Mac and iOS device by setting the Location of the feed to iCloud. Exchange does not support this feature.